We love homemade costumes and scary Halloween costumes. 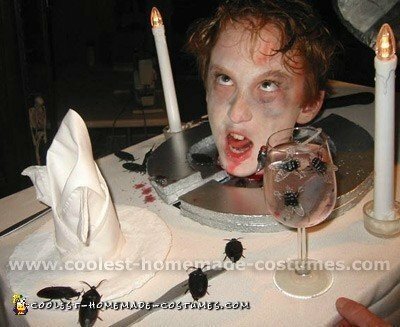 I searched the Internet for ideas and found this one called Head on a Platter. All we had was directions and suggestions, but no photos. So we went with our own ideas. Depending on the size of your person, get a box and cut a hole in it. Where you cut and the size of the hole depends on how much stuff you want on your table. Ours was not centered due to my daughter’s size, so we only had a place setting for three. We then glued fruit over the opening. To finish off her head, we used a plastic knife and glued it to a brown headband (color of hair) and painted parts of the knife red to represent the blood. We messed up her hair to cover the headband and make it look like she went through a fight. We used fake blood where the knife was sitting and let it run down her face to look like she had been stabbed. We put make-up under the eyes to make her look a little on the dead side. My daughter picked out her table setting; she wanted it to look colorful (you can use items to make a formal setting). The plates are paper dessert size; the fork and knife are regular size. Everything is hot glued down so she would not loose anything. I took red paint and painted inside the goblets to look like wine or blood which ever your mind might think. Since she had no hands to collect her goodies, we cut a hole in the first plate and the box and glued a trick or treat bag underneath to catch her goodies. We placed the sign telling people where to place the goodies so she would not have to speak. I did glue handles inside the box on the front wall to help her keep it level due to it being off centered. This did not take much time to put together, but we both had a lot of fun. The most time was deciding on the place settings and arranging them on the table. These scary Halloween costumes can be a 2-hour project. People were amazed at how she looked and she loved all the comments – especially that it was one of the most scary Halloween costumes they’d seen. 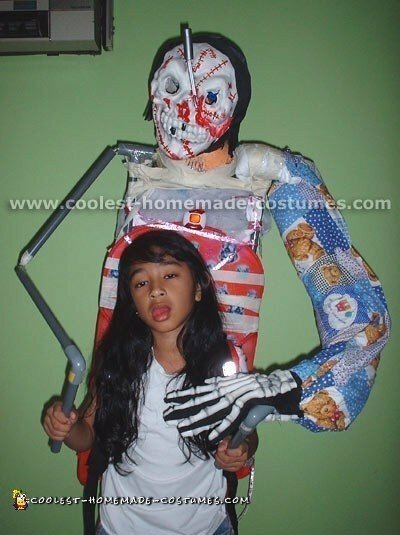 Thanks so much "Coolest Homemade Costumes" for great ideas for scary Halloween costumes! 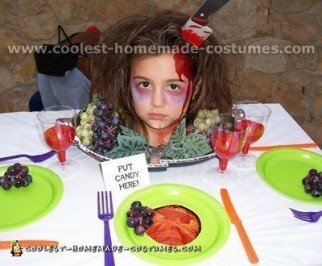 In searching for this year’s homemade masterpiece my daughter and I came across your site and found the head on the plate to be the perfect inspiration. We started with a box top, added a yard of bright fabric and a spider like placemat. There is a half circle shape cut out for her head to fit in so I cut a pie tin to fit the shape. Then layered in a sock and duct taped it for a cushion effect. We hot glued on plastic grapes, black worms and the large spider. I painted the inside of a plastic wine glass like I saw on your site and then added the silverware. For a final touch I used a red gift bag instead of a pumpkin. I wrote "Dinner is served" and glued on more silverware to the front. She received compliments at every single house and her classmates loved it! I cannot express enough how much ruckus this costume caused when I wore it trick or treating with my son. I could not walk three feet without someone asking to take a picture of it! 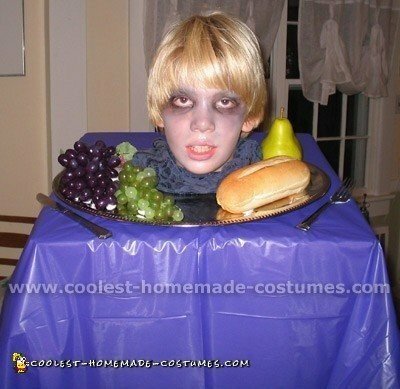 Every one commented that this is one of the most scary Halloween costumes they had seen. Trust me when I say you will not be left alone if you wear this. The best part was that this costume was so cheap and easy to make it just took a bit of time. All of the gluing I did was with my glue gun and everything stayed on like a charm even in the trunk of my car and walking side ways with it through door ways. THE TABLE: I cut one large square box in half and only used the top. I cut a hole a bit larger than my head and re-enforced the underside of it (side that would sit on my shoulders) with wooden craft sticks that were about a foot and a half long. You could even use heavy cardboard instead, just something to make the box nice and stiff. THE TABLE TOP: Next covered the "table" with red and white checkered table cloths and cut a hole for the head. I bought a cheap plastic platter from Party City and cut a whole in that so it was slightly bigger than the hole in the table so my head wouldn’t scrape into it when I put the costume on. A friend of mine had some cheap salt and pepper shakers she didn’t need so I glued those onto the table along with a napkin and knife. THE SPAGHETTI: Cream colored yarn from the craft store. I unwound a whole bunch of it (I used about half of a full thing of yarn) and separated the two halves. I used a sponge craft paintbrush and just brushed on a rusty red acrylic paint to look like sauce. Once it was dried I glued the one half around the edges of the plate and left a bit over the edges to cover up my hole once I put the costume on. THE MEATBALLS: Believe it or not I just balled up paper towels, put a tiny rubber band around them and painted them brown with the sponge paintbrush. Once they dried I dabbed some of the red I used for the sauce on them. You wouldn’t believe how real they looked. I just glued them here and there to the spaghetti on the plate and the spaghetti for my hair. 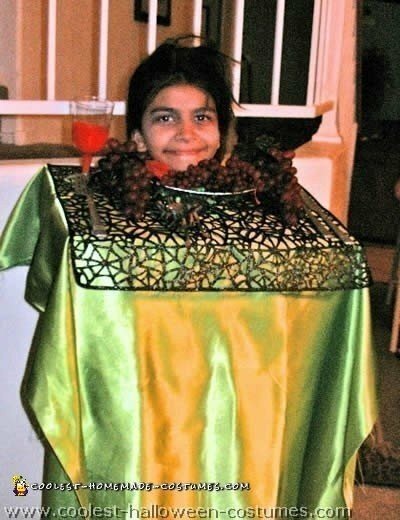 THE BOWL: The best part of this costume was the bowl I made for the table. I took a cheap thin plastic bowl and cut the circle part out of the bottom and glued it to the table. Next I cut a circle a bit more than halfway around creating a "door". 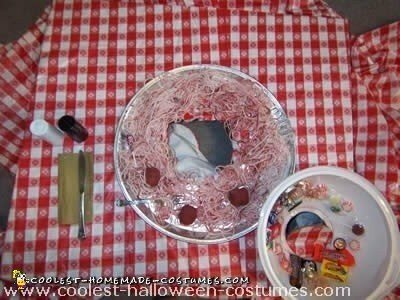 (Don’t remove the circle) Then I glued pieces of candy onto the inside of the bowl so it looked real to onlookers. 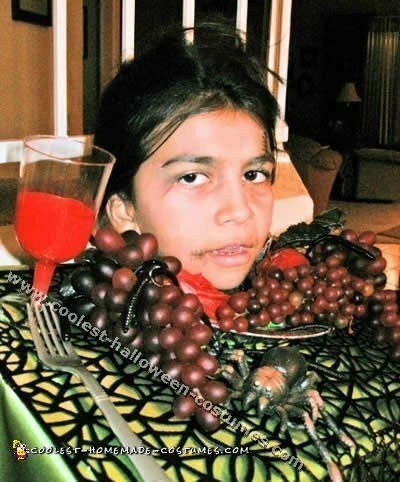 This enabled me to reach out and grab the hands of the people putting candy in my bowl and giving them a real "trick" for their "treat"!, As I said, this is one of many scary Halloween costumes that make people jump when they come near! My sister and I like to do scary Halloween costumes together. You see her sitting here at the "Head Table" on a platter decorated with lettuce and treats. I was the chef (complete with bloody apron and flies glued to my hat) and offered revelers a variety of Hors D’oeurves. We had blood clots (raspberry jellies), chocolate lady fingers, eyeballs and ears, gummy worms and spiders and candy ‘teeth’. I pretended to carve an ear off or pluck an eye to offer to the party goers. I’d wipe the ‘blood’ from the ‘carving set’ onto my apron. My sister also had her hand on a plate and would move it unexpectedly to startle people reaching for a treat. They loved it. It was worth pushing her around on the cart all night! We took first at the party. My son wanted something original for his Halloween party at school. 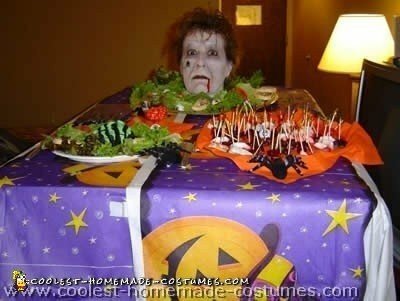 I came up with the idea of a Head on a Platter after seeing something on the food channel. 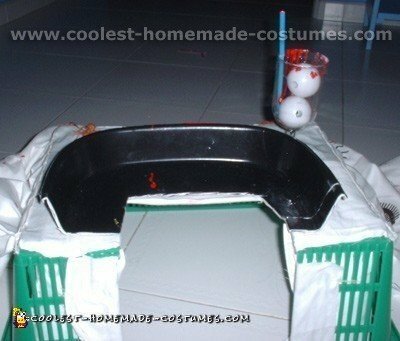 It was a real scary Halloween costume but very simple to create! I got a cardboard box, cut out one side and put it together with another side to make it sturdy. I bought a tablecloth at a dollar store. I cut a hole in the middle for his head and the "platter". The silver platter is actually a plastic serving dish. The fruit was about .50 cents each and the piece of felt around his neck as "garnish" was less than a dollar as well. Hot glue put the finishing touches on the silverware, plates, cups and votive candle to set the mood. Very easy! A little makeup to make him look dead and you have an award winning costume! Our spooky and scary Halloween costumes impressed and frightened my co-workers and trick-or-treaters. I was a head on a platter. The costume was very easy to make and only took about an hour to construct plus about 15 minutes to apply make-up and do my hair. My supplies (table cloth, goblet plate, tiny skull, knife, neck wound and make-up) all came from a party store. The platter silverware headband was all items I had around the house. They could all be easily obtained from a grocery store if you don’t have them. My "table" is two empty computer paper boxes duct taped together. The boxes rested on my shoulders. A semi-circle was cut through the top for my head and then just extend the cut out down the back of the box. That way you can slip it on and off without going over your head. The table cloth was then attached with rubber cement and staples. I stapled down the platter. You could not see the staples on the platter and a black sharpie marker will cover the staples on the table cloth. The other items were glued down with a hot glue gun on a low setting so it didn’t melt the plastic table cloth. My knife was cut down and then hot glued to a headband. I bobby pinned some hair over the headband. Of all the scary Halloween costumes, I won most unique costume at work and received lots of ohs, ahs and woahs from trick or treaters. This costume is a remake of one I did for my college roommate and her boyfriend but this time for my son and I! You can get make these sort of scary Halloween costumes for relatively cheap. All of the materials were things I had on hand as well as purchased at a craft materials store, a seasonal Halloween store and a second-hand store. The table and platter were made from foam core. Using an x-acto knife, I cut a hole in the center to accommodate my son’s head (measure the person’s head and neck first!) The platter is two halves of a foam-core circle spray-painted silver with a hole to form a sort of donut shape to accommodate his neck. I put industrial-strength Velcro on the bottom of the platter. The other half of the Velcro will come later. I bought a scrap of white material in the scrap pile at a fabric store for the tablecloth and cut a hole in the center to match the table hole. 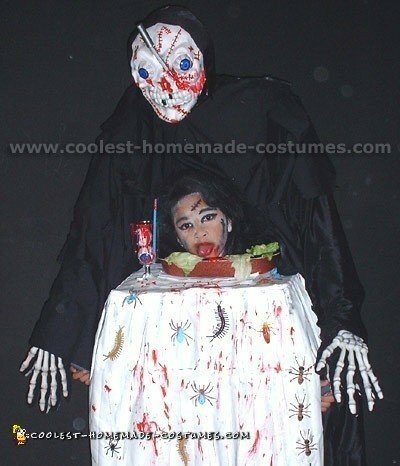 Using 3M (this brand is best) adhesive spray, I tacked the cloth onto the table, then placed the other half of the platter Velcro around the table hole so that the platter can be attached AFTER the person’s head goes through the table when ready to wear the costume. The dinner plate is made from Rigid Wrap modeled around a real plate. Rigid Wrap is what they used for medical casts. It is VERY useful for projects such as these. I used industrial-strength "E6000" glue and a hot glue gun to adhere the various items to the table. 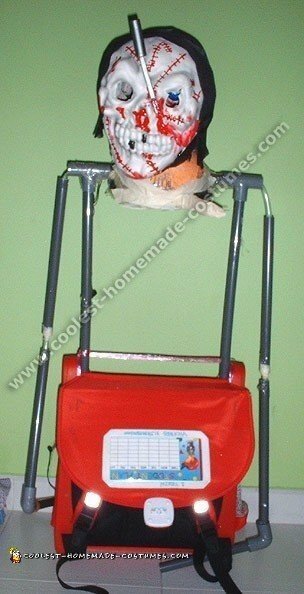 These include a fake plastic carving knife adorned with fake blood and flies, cockroaches, silver plastic flatware, a beautifully folded napkin, battery-operated candlesticks, a wine glass filled with candle gel with a fake dead rat in it. These added a nice, creepy touch. The piece that hides his head covering the platter (they use them in fancy restaurants and I can’t think of what it is called; we don’t go to them very often!) is made from rigid wrap formed around a wire armature around an inverted bowl and painted silver. Measure the length of the head first. My costume was a combination of clothes I already had and a bow tie I made with black elastic and a scrap of material, a jacket, cummerbund and shirt purchased at a second-hand shop! They have this stuff prominently displayed before Halloween. I borrowed my brother’s devil’s horns and make-up kit (hmmm…why does my older brother have these on hand??). My son’s make-up is just white, blue and black to make him look drained of blood along with fake blood around his neck. It is gross, but effective. Scary Halloween costumes are the best! I got this idea partly from a Web site (scary halloween costumes are great!). I went to the dollar store and bought a table cloth and a fake silver platter (plastic). I then went to the craft store and bought some fake fruit. We had an old computer box in the garage, and I used that for the table. I cut out a hole for my arms and head and glued the table cloth and other things onto it. 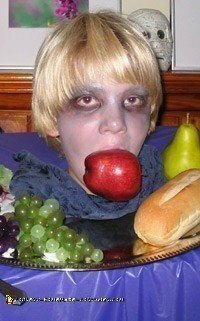 I used some real food from the kitchen, too., , Before I put it on, I put on make-up to make my skin look grey. Then I wrapped a napkin around my neck to protect it from the jagged edges of the platter and the box. When I went trick-or-treating, people loved this costume and kept saying that is was one of the most scary Halloween costumes they’d seen! These type of scary Halloween costumes have great optical illusion to them, which is a sure-fire way to grab people’s attention. I liked the Head on a platter look, but I wanted something more. 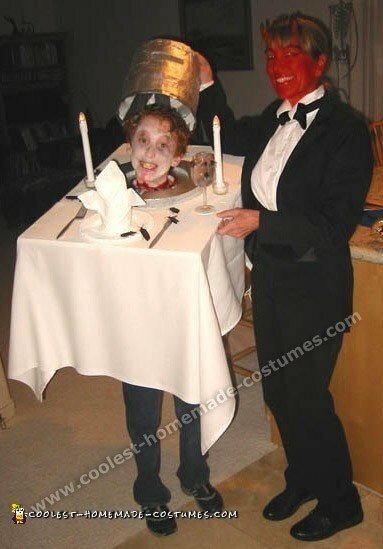 I made my “head on a platter” look like a monster carrying a table with the head on a platter. This monster could actually move his arms and the illusion was that there were 2 people in one costume. The arm movements needed to be realistic; therefore I created this monster with “elbows” and taught my daughter how to maneuver the monster like a giant puppet. It is actually very easy and inexpensive to make. You need: Thin sturdy plastic pipes, 2 “T” pipe connectors, 2 “L” pipe connectors, clear plastic tubing that fits through the plastic pipes, black material, a sturdy basket, a sturdy backpack, a cheap mask, papier-mâché, a balloon for the head shape, lots of masking tape and approximately two hours to make. , Creating the monster which is “behind” my daughter: Two pipes were cut the exact length and I securely tied these pipes to the backpack. A shorter pipe was connected with “T” corners perpendicular to the two pipes tied to the backpack. You have now created the “body” and “shoulders” of the monster. For the scary Halloween costumes neck, I placed an upside-down colander on the small pipe. I used plenty of masking tape to keep it in place. 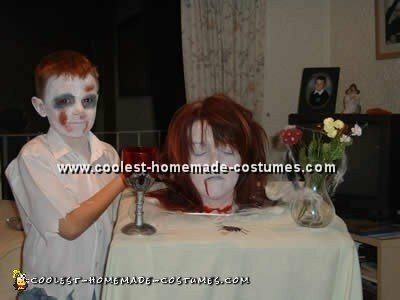 The scary Halloween costumes head is made from papier-mâché. I attached the mask to the paper mache, and then I added eyeballs (luckily I found these eyeballs that lit up). It made him look scarier with his eye lit up. I added blood, a toy plastic knife, etc. to create a scary monster. I even had his eyeball bulging out! I attached the head with tape. , I wanted the monster to have arms that moved. I bought 3 meters of plastic pipe and threaded it through the top of the pipes. They were kind of like veins, which connected the two pipes and gave him flexibility in movement! Then I cut 4 more plastic pipes; 2 represented the upper arm bones and 2 were for the lower arm bones. The plastic piping kept the bones attached to the body of the monster and the gap between the upper and lower “arm” gave the elbow effect. Stuffing and shoulder pads give the monster the effect of being a real person. I put padding on the shoulders, arms and body. The scary Halloween costumes clothes are made from black material. I cut it here and there to make it look spooky. I put white powder on the costume and it made him look “dusty”. He should look like he’s wearing a black “cloak” with long draped sleeves. With the long arm holes, this allowed my own daughter to “hide” her arms through the monsters “sleeves”., , To give the monster legs, I dressed my daughter in black boots and made a simple black long skirt to give the illusion that her legs and the black skirt were a part of the monster. At the end of the lower arm, I added the “L” corner to the pipe and added another pipe to it for the hands. This was for my daughter to hold onto to make the arms move! The “L” was hidden in the “skeleton glove”. I bought that from Toys R us for about $5. I bought two pairs and sewed a pair together so the “bones” were on the front and back of his “hands”. The extension from the “L” pipe protruded out of the “hands” and she held onto these pipes and was able to swing them out, in, back and forth., , She practiced in front of the mirror and learned to make his movements look real. She even purposely “hit herself” with the “hands” to make it look like he hit her. At first, she would have the “hands” holding the table and it looked very real!! 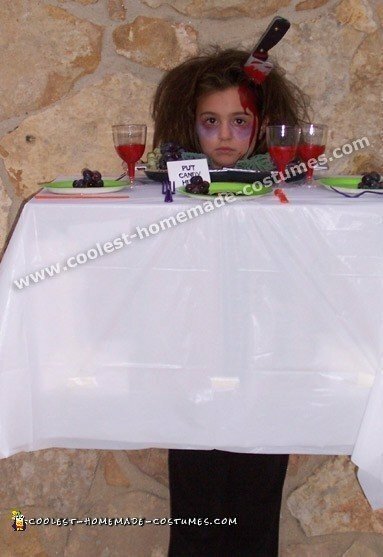 For the scary Halloween costumes table: I turned a rectangle basket upside down and cut out a section for my daughter to slide her head through. Basically, the basket kind of “hooked” onto her and hung from her shoulders. Tablecloth: I glued the tablecloth to the “table” (basket). I made it a little shorter than her (tablecloth is shoulders to mid calf) so people could see her boots and think it was part of the monster.